See a roughly contemporary pad, Society, and a "silent purchase" ad for Modess, 1928. 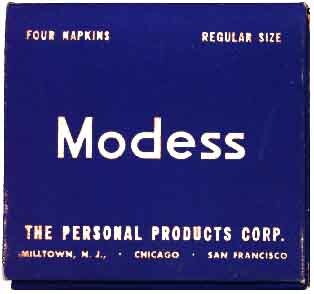 Other Modess ads: 1931,"Modess . . . . because" ads, the French Modess, and the German "Freedom" (Kimberly-Clark) for teens. See a prototype of the first Kotex ad. The box is as blue as you can get, in spite of Dr. Gilbreth's exasperation with the color; and Kotex was famously blue. Maybe the "blue fluid" so laughed at today in menstrual products advertising is simply a carryover of an advertising gimmick, that of putting the company color everywhere. As I mentioned earlier, the company calls it a "boudoir box," and intended it to be unidentifiable. But it has writing on all six sides (you see only three, below) and the word "Modess" is 5.25" (13.4 cm) long and 1.125" (2.9 cm) high on each of the four long sides. Go figure. The box measures 7.75" (20.5 cm) wide, 3" (7.6 cm) high and 3.25" (8.2 cm) deep. The copy of the report that I read, which might be unique, rests in the special collections of Purdue University, West Lafayette, Indiana, U.S.A. Dr. Gilbreth was the first woman engineering professor at Purdue.